Rocky Mountain Rollergirls was founded in August 2004. At the time, there were only 14 roller derby teams in existence. The sport has grown rapidly, with more than 1,000 teams worldwide. Rocky Mountain Rollergirls is one of the founding members of the WFTDA (Women’s Flat Track Derby Association), which was established one week before our first public bout in July of 2005 at the former Bladium Sports Club. WFTDA has since become a governing institution. Rocky’s first bout featured our two original home teams: the Red Ridin’ Hoods and the Sugar Kill Gang. In January of 2006, we played our first interleague game in Las Vegas against the Sin City Rollergirls. At the very first official tournament in February of 2006 – the Dust Devil in Tucson – we finished in last place out of 20 teams. We used the experience to make us stronger and continued paving the way for roller derby locally, regionally and internationally. In April of 2006, we hosted our first interleague game in Denver (again, against Sin City) and won. December of that year, the Rocky Mountain Rollergirls traveled to Edmonton, Canada to play the Oil City Derby Girls in the first international modern flat track bout. In November of 2009, our A travel team, 5280 Fight Club, made its debut at the WFTDA Championships in Philadelphia and finished in 4th place. In Denver, roller derby and the Rocky Mountain Rollergirls quickly grew a following. In 2009, a third home team, the Dooms Daisies, was added to accommodate our growing membership. Fight Club took 1st place at the 2010 WFTDA Western Regional Tournament in Sacramento by beating the Oly Rollers from Olympia, Washington, who had never lost a game prior to that day. Fight Club advanced on to the Championships that year in Chicago and defeated Oly again (by only 1 point!) to earn the title of WFTDA Champions, giving the Rocky Mountain Rollergirls the bragging rights associated with being #1 in the world. In 2011, Rocky Mountain Rollergirls had five skaters named to Team USA for the 1st Roller Derby World Cup in Toronto, Canada: DeRanged, Psycho Babble, Urrk’n Jerk’n, Amanda Jamitinya, and Team USA captain, Frida Beater. In August of that year, members of Fight Club traveled to the UK to play the London Rollergirls and held a very successful bootcamp bootcamp in Birmingham, England. The popularity of roller derby in Denver and the Rocky Mountain Rollergirls continued to rise, both in terms of spectators and the league. In 2011, due to yet even more growth, a fourth home team was added – the United States Pummeling Service (USPS). In 2012, we expanded our collection of travel teams to include a “C” team — Project Mayhem. Home and Travel teams are pulled from our undrafted skate team, the Kill Scouts. The Rocky Mountain logo was created by artist Jay Vollmar, an avid wheelman himself, who continues to design our bout posters and now sells roller derby art at most major tournaments. 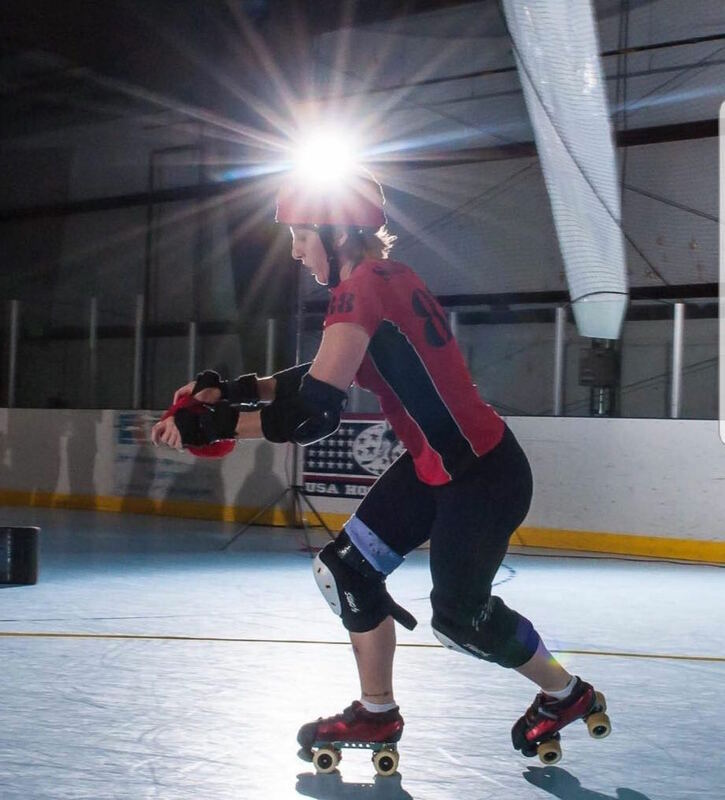 Although our organization has seen many faces come and go, there are skaters who have been with the Rocky Mountain Rollergirls for many years. She Who Cannot Be Named has been with Rocky Mountain Rollergirls since 2004, Assaultin’ Pepa and Winona Fighter since 2005, and BATass, Misstress Tarable and Ho J Simpson since 2006. These Vets tenure on Rocky are a testimony to the love of the game and of our league. From Fight Club to Freshmeat, we’re all proud to call Rocky Mountain our home.